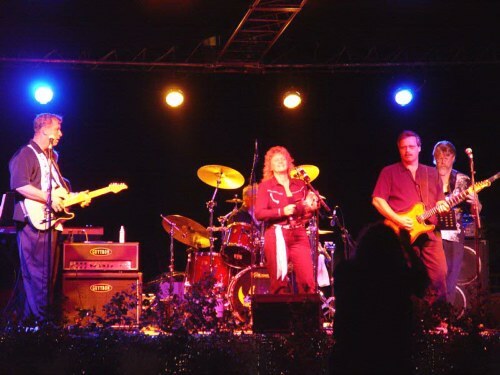 In January of 1992, the city of Clermont, Florida became the home of a newly formed group of professional studio and tour musicians who were to become known as BABY BLUES and the NO ATTITUDE BAND. From their first concert with Johnny Winter, it was obvious that this tour-wise collection of some of the finest studio players in the Orlando area was here to stay. Having arrived in Orlando from all parts of the globe, they all had one thing in common: They had all played with the legends of the music business. And now, they have released their own debut CD entitled, "REAL BEAUTY". During their 13 years together, BABY BLUES have been writing and recording their own original material, as well as producing their own videos, while touring and performing in concerts, festivals, conventions, and the premier clubs throughout the Southeastern U.S. A listing of past clients include, but is not limited to: Walt Disney Productions, Universal Studios, Universal Productions, City Of Orlando, City Of Apopka, City Of Clermont, Orange County, People's State Bank, Citrus Bowl Productions, Lake Wales Mardi Gras Productions, American Heart Association, Lakeridge Winery, and City Of Miami. In 1997, BABY BLUES released their first album, entitled "Real Beauty", which won them their "Band Of The Year" award from the Philips Phile, on Real Radio 104.1 FM, in Orlando, Florida. That album continues, to this day, to be played in over 20 countries, and on college radio stations throughout the US. BABY BLUES features the vocal artistry that few bands today can match, with Leslie Eberline singing lead vocals and harmonies with her male counterparts. Her flashing blue eyes were the inspiration for the group's name, and her powerful four and a half octave voice is the heart and soul of the band. Audiences everywhere are falling in love with this new star on the rise. music academy in the Southeastern United States. as one of the ten top drummers in Metal, as he performs around the world with his band from Orlando, named Trivium. will show up soon as newly recorded hits. Steve Franklin is the backbone of the band on the bass, and vocals. Ned Renz, one smokin' lead guitar, who pairs up with Marti as his co-lead, is the slide playing front man, also offering his special brand of lead vocal into the mix. AND, IF YOU HIT ONE OF THOSE LUCKY NIGHTS, Dale Elkins, 7 time touring harp player for Lynyrd Skynyrd, and former member of the Ozark Mountain Daredevils, makes an appearance to play with his friends in BABY BLUES. BABY BLUES. You never know when an industry icon might come along to jam with this group of veterans. On their larger performances, BABY BLUES brings out their horn section, and then you better buckle your seat belts, because they're gonna rock you. National recording companies are showing interest in this young Florida band that plays shows for 25,000 people, or in small listening rooms of 100 people as "unplugged"
To see a BABY BLUES show is to attend the party of the month. Their own unique style of blending Austin, Texas and New Orleans styles of Cajun music wraps together Rockabilly, Rock and Roll, Rhythm and Blues, Soul, and even every now and then a touch of Texas Swing into a blend that audiences are going wild over. The bottom line to all of this is that there just aren't that many places you can still go to see fabulous talent combined with energy and originality such as you experience at every BABY BLUES show. So, as this band moves out of their central Florida base and into the National picture in 2005, don't miss one of their shows. It will be one night that you and all of your friends will talk about for a long time; it is why BABY BLUES is the headline act in Central Florida this year! major festivals, and continuing across the US, ending in Washington D.C. So, keep an eye on their calendar found on this web site for dates near you! You won't want to miss them!! P.S.~ They still won't be allowing Joey to sing!! Joey Eberline's autographed Zildjian drumsticks, hanging in the Hard Rock collection.